In the Quran Abraham's name is mentioned 69 times. Prophet Abraham is one of the ulu'l azm prophets (great prophets) mentioned in the Quran. There is more information about Prophet Abraham than about most other prophets in the Torah, in Jewish literature in general, in Christian literature, in the Quran, and in Islamic literature; Prophet Abraham is seen as a forefather by Jews, Christians and Muslims. Particularly in Jewish and Islamic sources, Prophet Abraham is mentioned most often in connection with his efforts to instruct in the belief of oneness or the unity of Allah. According to the Torah, Abraham's name was originally Abram, which means "great father"; it later became Abraham, which means "father of nations." In the Quran Abraham's name is mentioned 69 times. Prophet Abraham is one of the ulu'l azm prophets (great prophets) mentioned in the Quran. In line with the general method adopted by the Quran that provides information about the prophets for instruction in religion and morality and takes examples from their lives, the Quran does not provide chronological information about Prophet Abraham, unlike the Torah. Instead, the Quran introduces his role in the history of faith, as well as giving the main aspects of his teachings, his service and methods for spreading the word of Allah; it also describes religious, moral, social and familial aspects of his life, giving pertinent examples. When he was sent to his nation as a prophet, Abraham first delivered the word of Allah to his father, however, his father threatened to disown him. Then he invited his nation to believe in Allah, but he was not successful. The Quran indicates that Abraham pleaded with Allah to forgive his father, but this was not accepted. In the Quran, it is stated that Abraham struggled with the idols that his father and nation worshipped and he defended the unity of Allah. He told his nation that it was meaningless to worship heavenly bodies or their symbols, and he warned them not to believe in these objects, as they were not able to help or harm anyone. We are told in the Quran how Abraham was thrown into the fire by the idol worshippers because he had destroyed the idols in the temple; yet, this fire did not harm him in any way. Other events in which he made efforts to deliver the word of Allah are also related. As explained in other Islamic sources, as well as in the Quran, Abraham left Nimrod's land with his wife Sarah, his nephew Lot, and his men; first he stayed for some time in Harran, then in Jordan and Egypt, finally returning to Palestine. After his emigration, as he was elderly and did not have any children, Abraham prayed to Allah for a virtuous child. Allah sent him the glad tidings that a wise (gentle) child would be born. According to both the Torah and the Quran, Abraham's first child was Ishmael, the child of Abraham and his second wife Hagar. Islamic sources state that although Sarah had given Hagar to Abraham voluntarily upon Ishmael's birth she was jealous of Hagar and Ishmael and she did not want to live with them anymore. Then Allah commanded Abraham to take Hagar and Ishmael to Mecca. However, there is controversy about where they were sent and how old Ishmael was at this time. After leaving Hagar and Ishmael in Mecca, Abraham lived in Palestine. When his first son Ishmael was old enough to walk Abraham was put to a test by Allah and ordered to sacrifice his son. Abraham passed this test and as a reward his name became immortalized with the people who followed after him. Sometimes Abraham visited Hagar and Ishmael in Mecca. According to some sources, he made three visits to Mecca from Palestine. Upon Allah's command, he made his first visit with Buraq (horse), under the guidance of Archangel Gabriel. On this trip he took his two-year old son Ishmael and Hagar on Buraq and took them to the site of the Kaaba. On his second visit to see his family in Mecca, he learned that Hagar had died and he was unable to see Ishmael. When Allah ordered him to build the Kaaba, he made his third visit to Mecca. 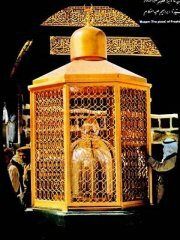 He built the Kaaba with his son and gave him the duty of proclaiming the pilgrimage. In the Quran it is not mentioned where or how Abraham died, but it is stated in other Islamic sources that Abraham was 200 or 175 years old and that he was buried in Hebron next to the grave of his wife Sarah. In the hadiths and history books it is indicated that Prophet Abraham was of medium height, and was a beautiful and cheerful person; he had hazel eyes and a wide forehead. Physically, Prophet Muhammad greatly resembled him. It is also narrated that he spoke Syrian in Kusa, but when he passed over the Euphrates after leaving Harran, he began to speak Hebrew. Also, he is remembered as abu al-adyaf (the father of guests); he circumcised himself at the age of 120 and freed his 300 slaves, who all then accepted Islam, the message of all the prophets. Abraham prayed to Allah to make Mecca a city of peace (Al-Baqara 2/26; Al-Abraham 14/35), he proclaimed Mecca to be a holy city, and he prohibited the shedding of blood and other actions that were allowed in other cities from being done there. There is a great deal of information about Prophet Abraham's personality as well as his spiritual and moral qualities in the Quran: He was a descendant from the nation of Noah (As-Saffat 37/83), he is the father of believers (Al-Haj 22/78) and a friend of Allah (An-Nisa 4/125). He was shown the kingdom of the heavens and the earth (Al-An'am 6/75). He immigrated to the location where his Lord had commanded (Al-Ankabut 29/26; As-Saffat 37/99). His offspring were given the prophecy and the book (An-Nisa 4/54; Al-Hadid 57/26). Abraham was tried by his Lord with certain commands, all of which he fulfilled, and as a result he was made imam to the nations (Al-Baqara 2/124). Abraham pleaded with Allah to make leaders from his offspring, but Allah answered that His promise is not within the reach of the evil-doers (Al-Baqara 2/124). This verse proves that people of Israel's belief that they are "Allah's selected people" is invalid. Abraham prayed to Allah to make Mecca a city of peace (Al-Baqara 2/26; Al-Abraham 14/35), he proclaimed Mecca to be a holy city, and he prohibited the shedding of blood and other actions that were allowed in other cities from being done there. He asked Allah to make a community from his nation that bowed before Allah and to send a prophet to them (Al-Baqara 2/126-129; Al-Abraham 14/35, 40.) The prophet who is requested in the prayers of Abraham and his son Ishmael is Prophet Muhammad. In fact, there was no other prophet among Ishmael's descendants. Also, the hadith (saying of the Prophet) "I am the prayer of my father Abraham, the gospel of my brother Jesus, and the dream of my mother" supports this. As a thanksgiving for Abraham's prayer, Muslims recite his name in their daily prayers. In the Quran, the claims of Jews and Christians that Abraham, Ishmael, Isaac, Jacob and their descendants are Jewish or Christian are rejected (Al-Baqara 2/135, 140); we are reminded that the Torah and the Bible (Gospels) were sent after Abraham (Al-i Imran 3/65). As an answer to the Christians and Jews who say "Become Jews or Christians if you want to be guided to salvation", Muslims should reply "We would rather follow the Religion of Abraham the True, he joined not gods with Allah" (Al-Baqara 2/135). On the other hand, the Arab idol worshippers were proud of being descendants of Abraham and having the duty of protecting the Kaaba which he had built. But the Quran reminds us that Abraham was never an idol worshipper, but rather that he had always been a good Muslim who knew his Lord (Ali Imran 3/95). In the Quran, Abraham's teachings are given a special value. Thus, Prophet Muhammad was commanded to "follow the religion of Abraham, the sane in faith; he was not of the Pagans" (Ali Imran 3/95; An-Nahl 16/123). The Messenger of Allah also revealed this in the hadiths. Abraham was given beauty and he was among the distinguished people in this world and the auspicious people in the hereafter. Please type '172' into this field.